This Choice stainless steel flatware cylinder is ideal for frequent use in your high-volume operation. Perfect for the everyday operations of your food service establishment, this multi-purpose stainless steel flatware cylinder can be transferred directly from your back-of-house area to your self-service station, providing a convenient, sanitary storage place for your spoons, forks, and knives. Simply place this cylinder at the beginning of a buffet line or display it on a table for guests to select their own disposable or reusable utensils. It can also be used on its own or with select flatware cylinder holders (sold separately). For extra versatility, this cylinder is stackable to save you on storage space when it is not in use. Very easy to keep clean and holds just enough silverware for out backup station. Absolutely no issues with rust. Having these out on the floor helps with convenience for our guest and servers. I use these cylinders to hold silverware in our small kitchen. The holes are great for allowing everything to dry. The best part is that I have not seen any rust build up! Silverware holder is inexpensive and sturdy. Holds lots of forks, spoons or knives. Does not seem prone to rusting even when using to air dry after wash, rinse and sanitizing. Great quality and value for a flatware cylinder. We have used this product for over 2 years and it is still going strong. Would recommend purchasing. Just what we needed. Holding up very well. When full of knives( little top heavy) they are little unstable but we . Love them-so much better than white plastic ones. These cylinders are perfect! I ordered 4 of them and together, they held approximately 100 dessert spoons. They fit perfectly inside the 4-hole stainless steel holder and really looked nice. This particular Stainless Steel Flatware Cylinder has a simple, yet perfect and highly functional design. It does exactly what you expect and is very easy to clean when needed. Definitely recommended! This is a fantastic product for the price. We currently use this staineless steel flatware cylinder to hold plastic forks when we are at the farmers market. These stainless steel containers come in handy and have multiple uses. They are durable and light. Easy to wash by hand or in a dishwasher. These flatwear containers are very functional and much better priced than others on webstaurant store. They work perfectly fine and run through the dishwasher perfectly. We keep these at the bar for holding our dishers. The perforated design is practical because we are washing our dishers numerous times throughout a shift. This flatwear cylinder was a great purchase. Ours needed to be replaced and I love that there so affordable to do so . Highly reccomend ! Have run these through the dishwasher multiple times with flatware. They show no wear, stains or use. Edges are smooth and well finished. Will by purchasing more. Very handy and well priced. These are good for most applications. I am super glad they are stainless steel, as they are supposed to help let things drain. That is what we use them for anyway! I only wish there weren’t so many holes, as they don’t work that well for forks being this way. Very nice finish on these. They fit perfect in my flatware holder and make the catering table look a lot better. they are very easy to clean and have held up very well with lots of use. I bought these flatware containers for a small rack that I bought for the kitchen. They work great and are pretty strong. The prices is great too! This flatware cylinder is probably the best I have ever used. I love the stainless steel look and feel, and the holes allow for air to circulate through and orevent any mold buildup. This is a pretty strong stainless steel flatware cylinder. The edge has a flat rim for sliding into a cylinder holder. The cylinder has holes all throughout even underneath for easy drainage. I’ve had my (home) bar utensils in this for months. It’s gotten splashed, moved around, & knocked over a few times. It still looks perfectly new. No rust, no dents, nothing. It does make quite the racket against a marble surface, so I put a piece of shelf liner underneath. Problem solved. This stainless steel still flatware cylinder is great for front-of-house and back-of-house use because it is very durable and also very attractive looking. This is a great quality product and offered at a very low price. I bought a bunch of these for a deep drawer we were designing into our kitchen. We ended up not creating this drawer, so these were repurposed onto every desk in our house. They are perfect to hold pens, pencils, markers, etc. The kids now just grab the bin that they want (markers, colored pencils, etc) and head to their favorite corner for a day of creativity. We even have one in our tool “box” (really more of a closet) to hold screwdrivers, These things have hundreds if not thousands of uses. We use these when we're serving outside (home use). They are large enough for stainless steel flatware, but plastic ware does not get lost either. Highly recommend as they're easy to clean and store. We use these for our spoons and love them! We have the 3 tiered stacked holder they fit PERFECTLY! Nice size and holds quite a few spoons at once! I actually got this cylinder to hold my ice cream scoops. I was storing them flat in a drawer, but wanted an easier way to access them. Plus, I’m trying to use more of my open shelving and save cabinetry space for premium items. This container solved both problems. The flatware cylinder is ideal for smaller catered events. It's classy enough but not over the top. I've done one recent event in a lodge setting and these fit right in. Great product, I have it next to my sink to hold utensils temporarily. I was worried it might rust but I haven't had that issue yet! Great for storing and separating silverware. The holes are good for drainage if the silverware is still a little wet. Only downside is sometimes the forks get jammed in the holes and it makes it difficult to pull them out during the lunch rush. This Stainless steel silverware Holder is perfect for storing our catering silverware on the go but also great at home as an overflow we store for larger parties. Sturdy and perforated to allow silverware to air dry after washing. I use these for my plastic spoons. So far it has held up well and looks great. You can use these for other items as well. For the price it's great! The stainless steel looks great, and it matches the modern look of the restaurant. You can have silverwear out where the guest can see it and it be to code as well. This looks so commercial but I still think it looks great in my kitchen. I use it mostly for holding any mismatced utensils I have. A perfect replacement for the plastic ones that get brittle after time from dishwasher use. The are very solid for the price. I plan on ordering more. Stainless steel quality is fine for me and these stand by themselves. Good product to hold utensils in for storage. Chopsticks sometimes get stuck in holes. This flatware holder is a great cheap item to keep your small utensils organized. The stainless steel option is the best for keeping it clean. Would recommend to anyone who needs utensil storage. I liked these so much that I plan on ordering more. It is a perfect way to either serve the flatware or for storage, not to mention to be used after washing in order to allow them to dry (although I actually add paper towel to the inside when I am drying the flatware). Price for stainless is very good in comparison to plastic and looks better placed on a counter, or table. Ordered these to go with my three compartment utensil holder and they look perfect together. Now utensils are separated and still within reach at the table. We have lots of these for holding steak knives as well as dirty/clean tasting spoons. They have held up great. No rust. No breakage. Very versatile. these are a great container for silverware and other little stuff like that. it keeps things drained pretty well and the stainless steel is easy to clean up. these utensils holders are great. we ordered them for our office because we started going green and got rid of our plastic utensils. theyre also flat enough on the bottom to sit on the counter. Very great Stainless Steel cylinder with great value. Solid and better than plastic. 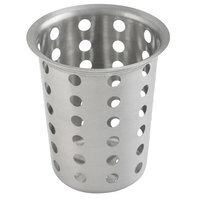 Work great with Eight Hole Stainless Steel Flatware Cylinder Holder. Recommended for the restaurant. These stainless steel flatware cylinders are great. They are amazing quality and I would highly recommend them to anyone. We use them to store our biodegradable flatware in at our bakery. I use these to separate the flatware in my dining room buffet server. Six fit perfectly in each drawer and then enough height room for the flatware. Now they are sectioned by each size fork, every size spoon, knives, etc. this goes to my utensils draining station. It's perfect for spoons, forks, knives, and any cooking utensils. The holes at the bottom let it drain and you can even store hem here. I got one for now to make sure it was the right size, I will be getting more of these since they fit perfectly. This stainless steel flatware cylinder looks nicer than the plastic one also available on webrestaurantstore.com. The stainless steel material is elegant and will last longer than the other one. This looks nice to hold almost every kitchen utensil there. And the price is great too. Bought them at first for my business as part of the cleaning process but since i had some as spare, i found new way to use them! Got 3 of them on my service tray at home for hold all the dinnerware. Got one on the side of the sink for hold brushes and sponge. Got one in the bathroom for hold toothbrush and I gifted some for share how amazing and versatile that product is. After a long time of use, still no rust or shine fading. Clean easy, look great, solid and just worth every penny. I use this in my retro bar to hold bartending tools! It's a hit. It's easy to clean and the stainless steel is great quality. These stainless steel flatware holders are spectacular. I use them to display my silverwear and they look great. I also use them to run flatwear threw the dishwasher and they work like a charm. We put all of our wet silverware in these after washing/rinsing/sanitizing. They dry nicely and very rarely have water spots since we started using the cylinders. These cylinder canisters hold up really well and look really nice on display. Only issue is that sometimes when you try and put forks face down they poke out through the holes and get stuck. All in all it's a great product. These stainless steel flatware cylinders are a wonderful way to keep flatware easily available on a buffet. We use these in a 4 container holder for spoons at our soup station. This product meets my business needs. It is of sturdy construction and seems like it will last a long time. I have had no issues at this time. You can't beat Webstaurant's price. This is a very sturdy flatware holder, with one minor issue. If used outside of one of those cylinder holders it tends to tip over because of the shape of the bottom. It definitely seems designed to fit into a holder. It has to be propped up against a back-splash to stay upright when you take a tool out of it. Recommended with reservations. if your kitchen is anything like ours, you've accumulated a great many utensils over time. We have these cylinders lined up along our backslash to hold all of our utensils so their easy to reach when needed. These cylinders hold them well, they are very sturdy and they look great! This flatware cylinder is great quality. It holds a good amount of utensils. It's very functional but also looks great. Our cafe and bakery use these and there's been no complaints! We use these for everything!! Stick a clear cup in them and use them as a planter in the middle of a table or we also use them for our flyers and free candy! This cup will get the job done. It is very thin, but it still looks decent. For the price it functions well. If you're going to run it through the dishwasher full of silverware, make sure you have Flatware Cylinder Carrier or something to keep it from tipping over. Great price, solid construction, good size for both disposable and stainless flatware. I'll be buying more when I open my next restaurant, that's for sure. Quality of the product was heavier than I expected - I should have ordered more as this was very useful and very quickly found it's way to store unconventional products. I posted a picture of storing basic household materials such as blades, lotions, stationary, you name it. Can also be used to store toothbrushes as it there are drainage holes underneath. Very useful! A staple for food service operators everywhere, these flatware cylinders are a must have in spatially restrictive dining operations. They take up little space, counter space can easily be altered to accommodate this flatware holding method. A little smaller than some others that I have. I use them to hold hand tools, such as tongs, openers, measuring spoon etc. They are too small to hold a turner, and they are just okay for cooking spoons. They do tend to tip over, so I prop them up against the back splash. These look great in our counter. They are super easy to clean and air circulates which is great because clients can be sure it is sanitary. I love the look of this little guy. I bought it for my studio apartment, as the kitchen is too small to have any drawers. Keeps the counter looking clean, and matches the silverware. Highly recommended! These are sturdy and stable utensil holders. I am temporarily using the cylinder without an organizer, but the cylinder does not tilt or fall. I am glad that the surface is very smooth and shiny. Really high quality cylinders and hold up well to abuse. I love the fact that they are stainless steel so they will not discolor over time like plastic ones do. Very durable, does not tip over. Very stylish. Love the holes so water come out.. No mildew or mold problem. Had 5 months and no rust. Wish I had 2 more. Very durable, good fit with companion item , stylish and clean. Will be purchasing additional ones in the future along with it's companion items. Great deal !! !